Some of the more common questions we get when we’re doing a consult for IV sedation – or when we have a new patient who is calling asking about dental twilight sedation – surrounds what medications we use. Do you use Versed? How about Fentanyl? Midazolam? Nitrous? Having helped hundreds of patients get through difficult procedures using sedation, we will first say that every case is unique. There is no “cookie cutter” approach. Dr. Nick Calcaterra thoroughly analyzes each patient’s past experiences, medical history, current medications, the planned procedure(s), and then comes up with a unique, customized sedation plan. Versed is in the benzodiazepine family. Although midazolam is available in more than one form, we use the liquid form and put it directly into the IV. It is painless as it goes into your veins (unlike its counterpart diazepam) and begins exerting the effects in less than a minute. The duration of action is approximately 30 minutes. When used in an IV, versed will produce sleepiness, decrease anxiety, and retrograde amnesia. The amnesia – basically the inability to form memories while being sedated with midazolam – is important and is mostly responsible for when our sedation patients say “I don’t remember a thing” (see our Youtube testimonials from Jen, Leslie, Liz, Helen, etc.). Fentanyl is an opioid medication. Opioids are a class of medications that act on the opioid receptor in your body. Previous definitions of this word included the fact that these medications resemble opium (the plant from which heroine is derived). Fentanyl is also considered to be a narcotic. The form of fentanyl we use is a liquid and we put it directly into the IV. 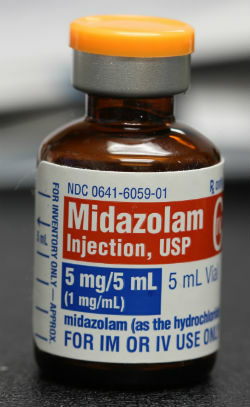 Just like midazolam, it is painless as it enters the IV and begins to exert the effects in 60 seconds or less. The duration of action in IV form is approximately 30 to 60 minutes. 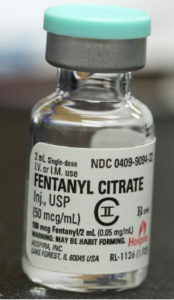 Fentanyl is used in dental IV sedation to relieve pain and produce drowsiness. When combined with midazolam, it is excellent in achieving both. And because the duration of action is so short, by the time you arrive home from your procedure, the effects of the fentanyl have worn off. Because fentanyl is an opioid, we avoid using it on patients who have a past history of drug abuse. Nitrous oxide is also called laughing gas. 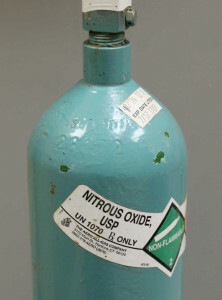 Unlike fentanyl and midazolam, nitrous oxide is a gas and is considered to be an inhalation anesthetic. Nitrous has very unique properties and is in a class by itself. Nitrous oxide is administered through a nasal hood which also delivers oxygen in addition to the nitrous. When used by itself, nitrous oxide will produce relaxation and euphoria. When used in combination with midazolam and fentanyl, it will accentuate the effects of both medications in addition to producing relaxation and euphoria. Besides the three medications we list above, we will sometimes use others. Triazolam – also know by the brand name Halcion, this is an oral benzodiazepene. Dr. Nick will often prescribe this pre-operatively for patients who are too nervous to even get into the chair. Our patients take it an hour before the procedure. They arrive nice and relaxed and ready to start the sedation. We also use it for needle-phobic patients who are scared of the IV start. Diphenhydramine – also known by the brand name Benadryl, this is a powerful antihistamine. Benadryl will cause drowsiness and will also dry out the mouth. Dr. Calcaterra will use this in select circumstances. Toradol (ketorolac) placed into the IV reduces pain and swelling after oral surgery. Ondansetron – also known by the brand name Zofran, this IV medication can be used for nausea. However, the incidence of post-op nausea in our patients is very low. But we still use it occasionally. 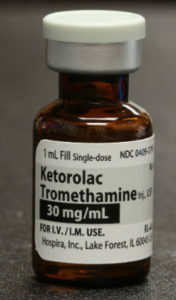 Ketorolac – also know by the brand name Toradol, this IV medication is a powerful NSAID pain reliever. Dr. Nick will administer this in his wisdom teeth or other tooth extraction cases. All of our patients report less post-operative pain because of this medication. Dexamethasone – also known by the generic name Decadron, this is a powerful steroid. This is used sometimes in surgical cases where post-operative swelling is expected. Cefazolin – also known by the generic name Ancef, this IV medication is a powerful cephalosporin antibiotic. Dr. Nick will administer this medication in cases of infection, immunocompromised patients, or other circumstances. In addition to the above, we also have dozens of medications for other uses. We exceed the requirements set forth by the state of Connecticut and the ADA. Interested in learning more about IV sedation? Would you like a consult with one of Connecticut’s most experienced sedation dentists? Call us at (203) 799 – 2929 or visit this page to request an appointment with Dr. Calcaterra.